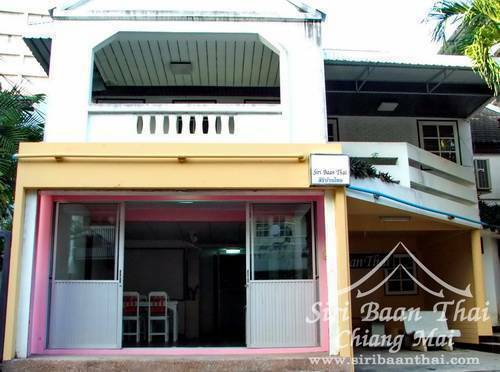 More than just an ordinary guesthouse, Siri Baan Thai offers a homey and romantic atmosphere, which is surrounded by the great and relaxing natural environment of the Chiang Mai city, and the charming area of "Old Town", in the heart of Chiang Mai. Here, you will experience the fascinating traditional and cultural touch of authentic Thai life in Chiang Mai, now known as Chiang Mai Night Bazaar, which attracts a lot of tourists and guests from all corners of the world. And, at just a ten-minute walk from Chiang Mai Night Bazaar, you will reach our guesthouse! You won't be disappointed with our warm and welcoming hospitality and convenient service at a reasonable price. We are certain that, you will feel like being right at home. 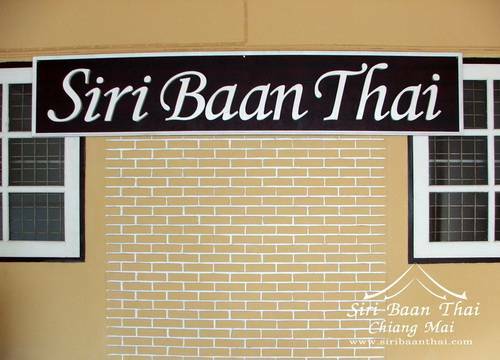 "Welcome to Siri Baan Thai Guesthouse!" Coffee, tea and juice facilities. Private out door garden patio. Unfortunately we do not accept payment by credit cards. Room rates include CBF breakfast . Check-in time is everytime. and Check-out time is 12:00 p. m. (midday). Early check-in and late check-out are subject to availability and individual policies. Office time 8:00 a. m. - 8:00 p. m.
After check-in you will get a key so you can come and go from Siribaanthai Guesthouse at any time you wish. 160 Sri Don Chai Road, Amphur Muang, Chiang Mai Thailand 50100. In the heart of Chiang Mai Behind the Chiang Mai Plaza hotel near Chiang Mai Night Bazaar and Anusan market. 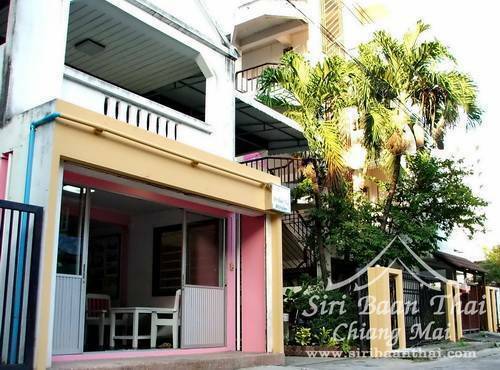 At just a ten-minute walk from Chiang Mai Night Bazaar, you will reach our guesthouse! If traveling from Chiang Mai Night Bazaar. Turn left at next intersection Pantip Chiangmai. Into the streets of Sri Don Chai About 50 meters. Chiang Mai Plaza Hotel in front and turn left Soi beside Chiang Mai Plaza Hotel About 20 meters. When found in three separate, turn right and follow through on the back of the village, about 20 meters to find a Siri Baan Thai building on the left hand. - Coffee, tea and juice facilities. 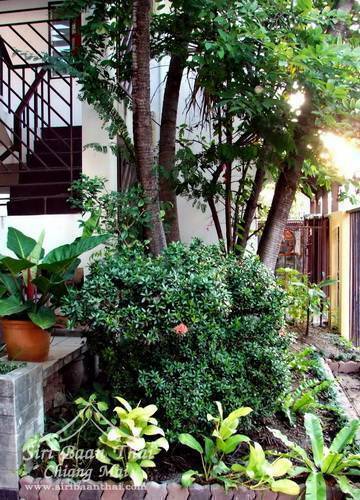 Standard Room Large furnished room with air conditioners, fans, balcony and shared bathroom 400 Baht per night. Superior Double Room with A/C Double bed room. Private Bathroom furniture, air conditioning, water heater. Price: 500 baht per night. 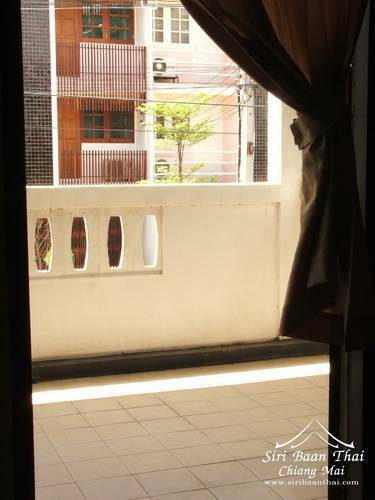 Family Room with A/C and fan 1 Double bed and 1 Single bed, Air conditioning Large balcony and private bathroom 600 baht per night Price does not limit the number of people stay.